Sakhi for South Asian Women was an official partner of the Women’s March in New York and a steering committee member of the march in Washington., D.C.
“Administration’s abuse of power must be met with accountability,” says Sakhi Executive Director Kavita Mehra. On January 19, for third year in row, women from across classes and cultures got together in different parts of the country to show their political strength and to create social change. There was significant South Asian and Indian American presence in the 2019 Women’s March as women came out to show their support and strength, braving the frigid weather. 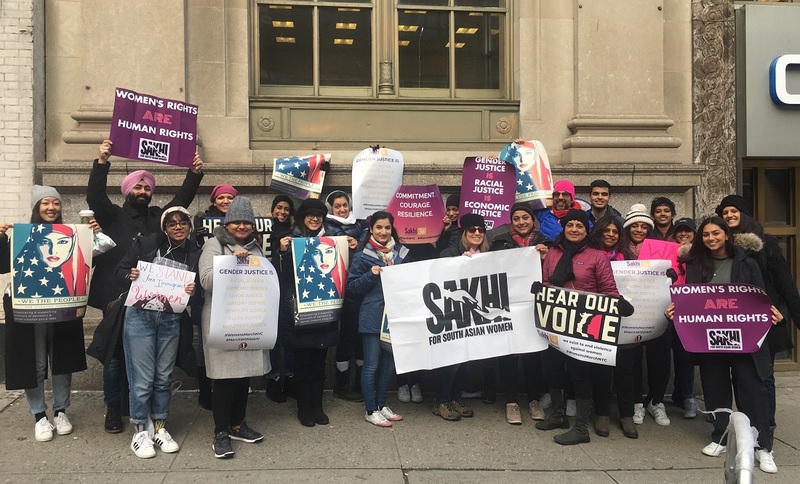 One of the organizations participating in the march was Sakhi for South Asian Women, a New York City-based advocacy organization for immigrant women. The organization, which is celebrating its 30th anniversary, participated in the Women’s March in New York City and Washington, D.C.
Sakhi was an official partner of the march in New York and a steering committee member of the one in Washington. The organization convened about 35 supporters and allies to advocate for progressive local and national discourse around equity and inclusivity. Since its inception, Sakhi has responded to more than 10,000 survivors of violence and consistently mobilized New York City’s South Asian immigrant community to take a stand against abuse. Throughout 2019, the organization will highlight its 30 years with celebratory events across the city. While news reports from across the country suggested that the participation in the marches was less compared to the previous two years, there were also reports that this year a number of moderates too joined in the marches, depicting a constant widening interest in this form of showing protest and resistance. The first Women’s March was held on January 21, 2017, the after Donald Trump was sworn in as the President of the United States.